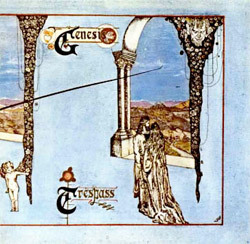 The eighteen months between the release of the Genesis debut in March 1969 and its successor Trespass in October of the following year are probably the decisive period in the history of Genesis. Everybody who knows both records cannot but notice just how impressively much the band had developed their style. Many a crucial experience from this period laid the foundation for what was to come. Once they had overcome the frustration in the wake of their first record things returned to normal. All of them continued to pursue their education, but the music and the experience of the months behind them would stay with them. Says Tony about his time in university: “I wrote quite a number of songs at that time. I could not play the piano because the music building was still under construction, so I wrote songs on my guitar which I found very interesting… it was a very productive period for me.” Though they met less frequently they used every minute to practise together. “… we would travel around all summer and rehearsed at friends’ places. Everybody’s parents went away for two or three weeks and we would roll in.”, Mike remembers. He and Ant developed their skills on the twelve-string guitar. And it was their new-found enthusiasm for music that prompted first themselves and later that summer also Tony and Peter to break off their education and become professional musicians in Genesis. The only exception was John Silver who did not want to run the risk of a career in music. The band were undeterred and tried to overcome the weaknesses that had surfaced when they had been recording their debut. Said Tony: "We had been rehearsing all summer but we had not played any gigs because we kept writing new material and learning new things. We recorded many demos during that time as well as in the months that followed." The band had found their new drummer in what used to be the usual way, i.e. an ad in Melody Maker, and they were now ready for their first gig: The famous party at Mrs Balms's in September 1969. With the cottage of Richard Macphail's familythey found the perfect place for the winter to focus on their career: "That was definitely the beginning of a new era because we started living with each other. This cottage period certainly left a strong mark", says Mike, and Richard recalls what the days were like there: "We would get up around 7 in the morning, have breakfast, and then we would rehearse for ten or eleven hours straight, interrupted only by lunch breaks." As the band became increasingly perfectionistic and he grew less and less satisfied with both his and the other’s input Ant decided to leave the band. He was not up to the new professional approach of the band, and problem then were not solved by talking about them but by “separations”. Ant: “I slowly realized that I could not exist in such a collective, democratic musical environment.” In the wake of this sharp loss the band thought “in for a penny, in for a pound” and also fired their drummer John Mayhew, who had never really been considered a full member of the band. But there was never a question of not continuing.